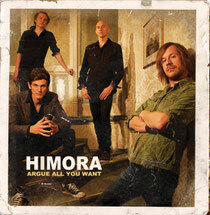 The Norwegian band HIMORA releases thier first album "Argue All You Want" from Drugstore Records on December 9, 2011. They have been playing together, on and off, for about a decade. They juggle '80s powerpop against a classic '70s rock swagger, like Cheap Trick meets Bad Company with a bit of old school Aerosmith / James Gang funkiness thrown in there too. They have been acted on a couple of Norwegian tours as backing band for Eric Martin (Mr. Big) . HIMORA has somehow slipped under the radar as far as commercial success goes.